For the first time spending via contactless payment cards has exceeded £100m in a month, The UK Cards Association has announced. 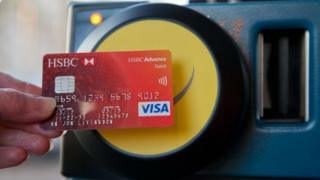 Consumers in the UK spent £109.2m on their contactless cards in March, three times what they spent a year ago. The cards can be used to pay for purchases of up to £20, by touching them on the readers. Over 42 million of the cards are now in circulation in the UK, and one in three consumers has one in their wallet. "Whether it's to buy a cup of coffee or pay for a trip on the bus, today's figures show that consumers are voting with their wallets and find contactless cards a very convenient way to pay," said Graham Peacop, managing director of The UK Cards Association. Barclaycard, which was the first to introduce the technology, said it expected its customers to spend £600m via contactless cards this year, double the amount spent last year. The cards can already be used on some bus and train services, including Merseyrail, and are due to be introduced onto the London tube network as well. After initial fears about fraud, the UK Cards Association has insisted the cards are perfectly secure. They use existing chip and PIN technology, and every so often will still prompt customers to enter their codes.